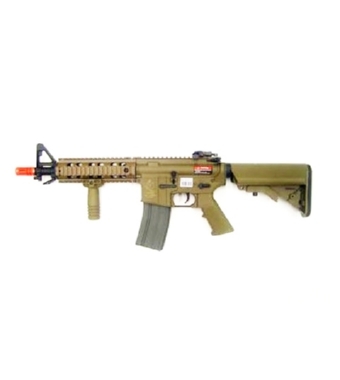 PRODOTTO DALLA ARES, FUCILE ELETTRICO MODELLO M4 RIS CQB SHORT, IN COLORAZIONE TAN. CARICATORE IN METALLO 130BB, PALLINO 6mm (CONSIGLIATI 0,20/0,23/0,25), MODALITÀ D'AZIONE A COLPO SINGOLO E RAFFICA. UTILIZZA SOLO BATTERIE CQB TYPE 8,4V-1200mAh (NON COMPRESE), CARICA BATTERIA 220V-300mA (NON COMPRESO). GUSCIO IN TECNOPOLIMERO, LOGO SERIGRAFATO, TACCA DI MIRA REGOLABILE E RIMOVIBILE ANTERIORE E POSTERIORE, IMPUGNATURA RIMOVIBILE TACTICAL SULL'ANTERIORE, 4 SLITTE IN METALLO PER IL FISSAGGIO DI ACCESSORI.